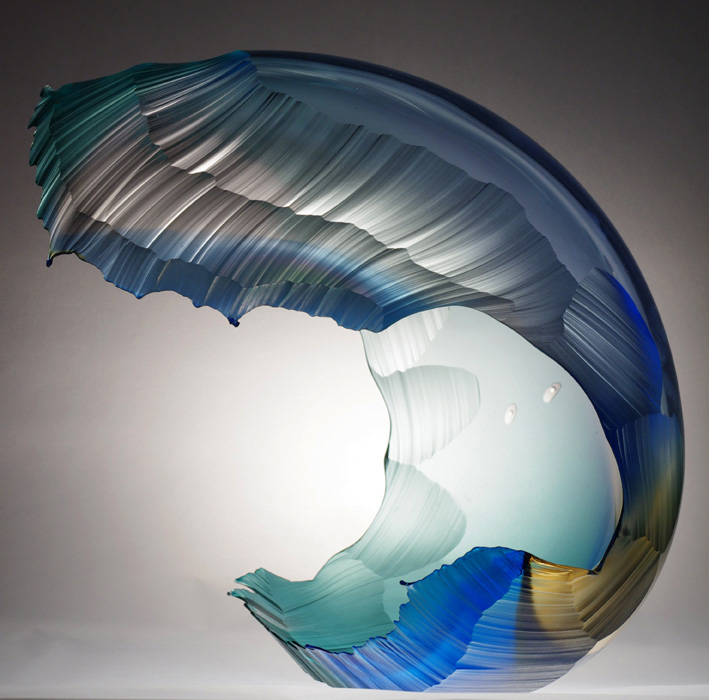 Precariously resting atop a pedestal, these wave-like glass vessels by Scottish artist Graham Muir seem to defy gravity as if frozen in a moment before crashing into the ocean. 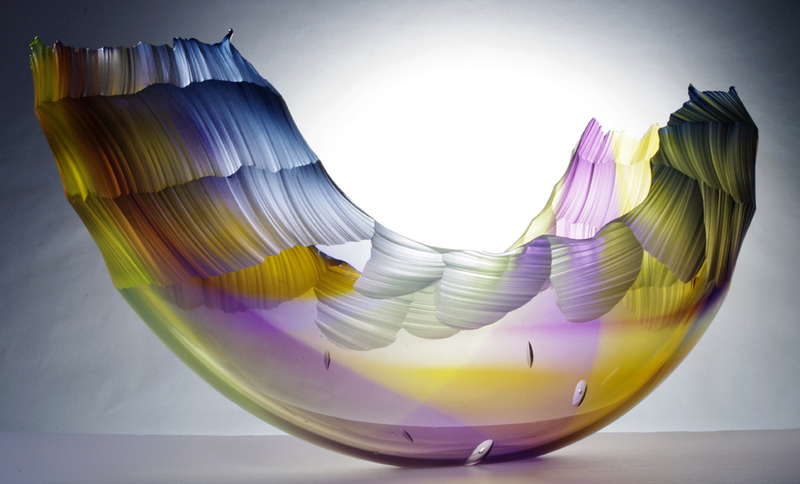 Using techniques perfected over the last decade, Muir achieves delicate shapes that seem almost chiseled or fractured, but are in fact accomplished when working while the glass is still hot. 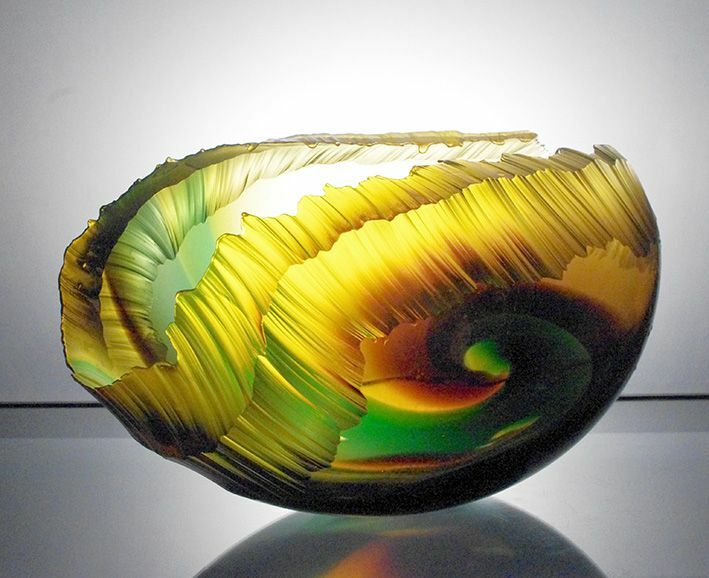 More of Graham Muir’s amazing glasswork can be found at https://grahammuir.co.uk/making-waves/..
‹ PreviousWhat Have You Been Up To? 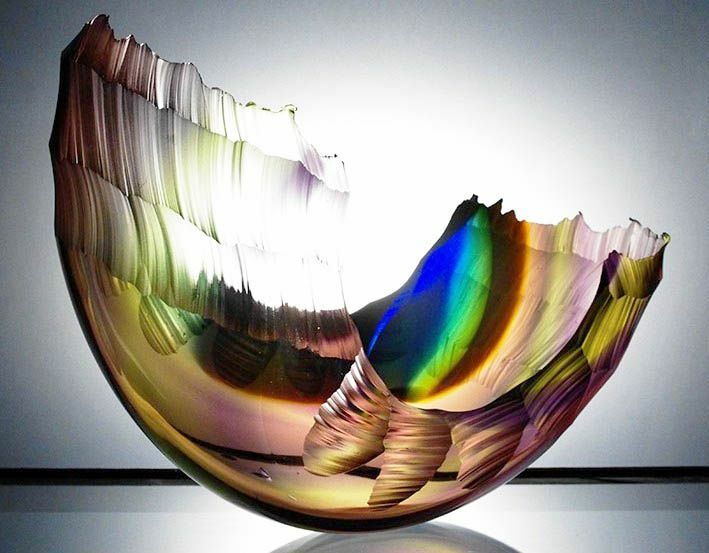 I love glass and am totally fascinated with glass blowers…simply stunning pieces. Apologies, error in initial link.. Thank you. And I started reading your stories about Ireland…do you live there? I can’t wait to go back and read the rest. I wish I could visit…I really do…My mother’s side is Irish, and I’ve adopted that way of thinking. And thank you again for the referral! And I should have paid more attention. Your page bio says you live in Australia. But you can be Irish and live anywhere! No, in Australia, born and bred… but with an Irish grandmother and 4th great grandmother, which counts for the strong Irish influence.. I love it. I live in Wisconsin, USA, and I elect to let my mother’s Irish blood flow through my veins. Of course, I’m half Polish, so there’s not a polka that I can’t dance to, but I’ve yet to master the Irish Jig. My other strong influence is Greek, as you will have ascertained from stories in this blog, so I am blessed with the joys of both cultures. See…your other half Greek, mine Polish…we make quite a pair! Wow !! these are stunning !! I love the colors and the unique shapes. They do look like a wave from the ocean! These are calming and stunning. Like the ocean, mesmerizing. I could stare at them for hours. Thank you. The blending of colors and that unique shape like a wave is something I’ve not seen before. 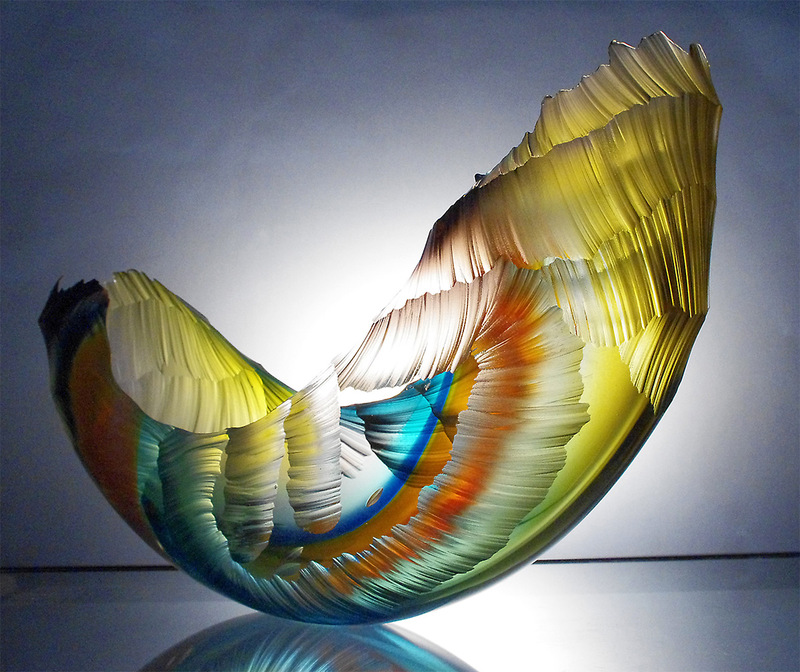 As an ex-industrial Chemist and doing a Chemistry Diploma, I thoroughly appreciated working with glass. I did a glass blowing course as part of my Diploma, ouchie very hot glass, !! These works are quite intricate and fascinating. Thank you Claudia. How cool! Did you keep any of your class creations? I watch glassblowers at the Renaissance Faire and they are amazing…and that is just small work. See…you DO multitask! I figured as much. I only asked because I was into painting right out of high school and I painted some psychedelic paintings…including a three piece scenery piece (Kinda like Avatar) and they’re still sitting in my downstairs someplace. Thank you! 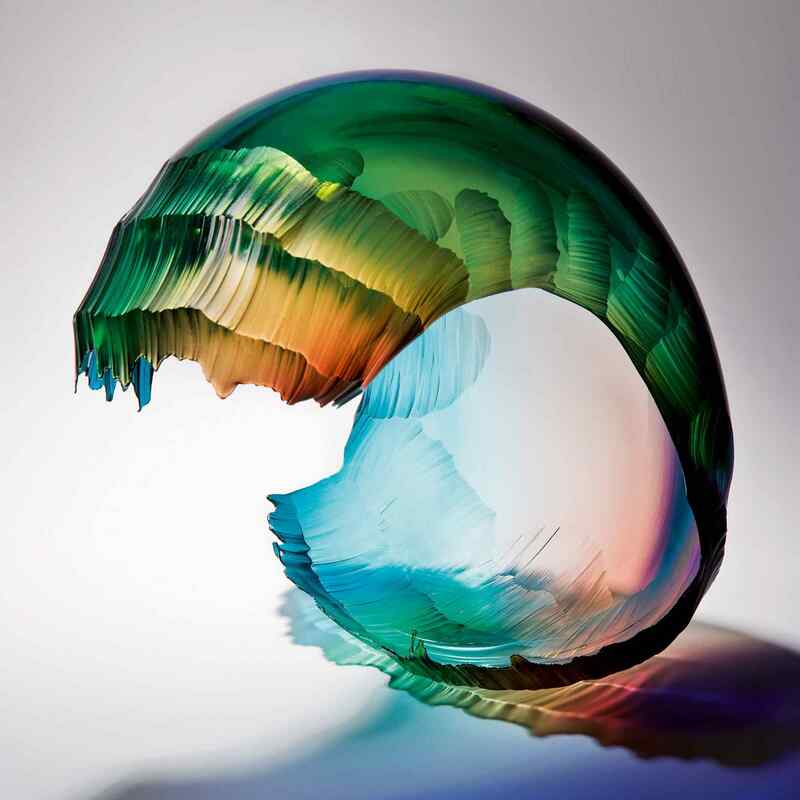 He is an amazing glass artist. These are so cool! I would love to have one of these. I think they’re amazing too. The blending of colors and the unique shape…I’d make a place for one in my livingroom too!